The spot for Jacksonville’s new PetSafe Dog Park used to be the MacMurray Cabin, and before that the Kiwanis Hut. Hobie Hinderliter, historian of the Jacksonville Kiwanis Club, passed on a book of the club’s history. Kiwanis started a campsite for girls and boys of the city in 1923, at a location about 6 miles east of town. The camp was later moved to Jacksonville parkland on the south shore of Mauvaisterre Lake, and a cabin was constructed by the club. Hobie said the Kiwanis Hut was used for family picnics for club members, burgoos for area schoolchildren, and an annual hamburger fry with memorable servings of watermelon. The cabin was later passed on to MacMurray College, and was used by their students and community before being transferred to the city of Jacksonville. 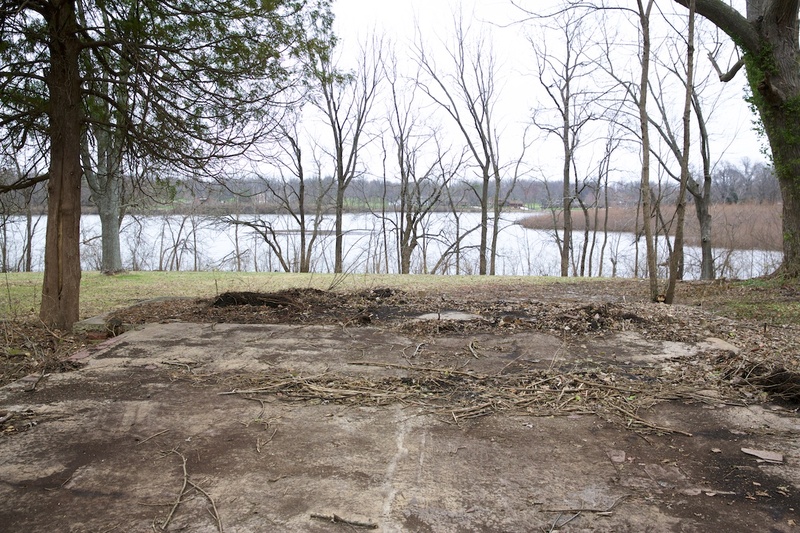 The foundation of the old MacMurray Cabin/Kiwanis Hut was recently cleared by Jacksonville Parks & Lakes workers as they prepare the site for the new Jacksonville dog park. Here’s some excerpts from the History of The Kiwanis Club of Jacksonville . . .
June 12th brought the first activity looking toward the construction of a Kiwanis Over-night Camp. Bricks were hauled to the site six miles east of the city. This movement, handled successfully by the Public Affairs Committee, headed by Dr. Bill Duncan and in absence by Lee Sullivan. This project was inaugurated by the Club on August 9th by the presentation of a perfected plan for the building of a Camp House. On September 1st initial work was started and on September 3rd, Labor Day, building began in earnest. This work was carried forward successfully by the committee to the most minute detail including the establishment of comprehensive Camp Riles. A report showed they had successfully built and paid for a splendid camp at a cost of approximately $1,000.00. It was turned over for the use of the boys and girls organizations of the City — a camp which, constructed privately, would cost as least $3,000. In the year 1927 the main project for the year was the moving of the Kiwanis Camp from the site East of Jacksonville. During the three years of its existence it was impossible to keep it in a fit condition for use. Break-ins, vandalism and the general destroying of the property made it imperative that we move it. Ted Beadles, Secretary-Treasurer of the Illinois Steel Bridge Company, was a member of our Board of Directors; he was also President of the Park Board. He suggested that we move it to a site on Lake Mauvaisterre. After some time a dollar a year lease was made with the Park Board for a site on the South side of the Lake and the North side of Vandalia Road. It was ecided we could build an all-year Cabin, fitted with bunkbeds, furnace, complete kitchen and toilets. Vets Chumley, a building contractor and an active member, was Chairman of the committee that supervised the work, most of which was done by members. At one meeting, we were served at the camp sire and we had a regular Cornerstone laying with all the ceremonies and placing papers in the stone. When the building was completed a committee handles its use. During the year we inaugurated the Family Picnic. This picnic was held at Kiwanis Hut. We had 78 in attendance, but that has grown and has become one of the most popular entertainments during the years. The Sammy Nichols Burgoo Picnic was given for all school children in all schools up to the Fifth Grade. That also was held at the Hut. All transportation was furnished by the club members by trucks and cars. During the year 1930 the undersigned, Hugh Green, was president of the Jacksonville Kiwanis Club. According to my recollection, that was the year in which the debt on the hut was finally paid off. The construction of the hut had been financed by issuance of bonds or notes which were held by various members of the Club. The finances were carefully guarded in order to meet the obligation. During that year the Hut was used considerably for various activities of the Club. It was found to be an excellent place to entertain the families of the club membership. We had our Family Picnic at the Kiwanis Hut, which was a very successful event. Another worthwhile project for the year for Underprivileged children was the “Burgoo” sponsored by a special committee headed by Pete Bonansinga. This picnic was held at the Kiwanis Hut and 400 gallons of soup were prepared and consumed by the children of the city. Back in November 1927 we laid the cornerstone for the Kiwanis Hut on Lake Mauvaisterre, which was operated successfully for several years. It finally became a “thorn in the flesh of Kiwanis“ and almost a “house of ill repute.“ Something had to be done — your president (A.B. Applebee) conceived the brilliant idea of selling it – literally to MacMurray College, and Hayden Walker, Hut Chairman, signed a sigh of relief when the deal was closed. Sense than hundreds of McEnery girls have transferred out too it’s beautiful setting for wiener roast and beefsteak bats (cq). Edited — New information from MacMurray College Historian Lauretta K. Scheller . . . MacMurray College leased the cabin from the city until May 1986. College catalogues listed the cabin as part of the recreation areas for the students. A couple that worked for the college and tended to the cabin’s care retired in 1973. The area known for the MacMurray Cabin and Kiwanis Hut is being cleared by City of Jacksonville Parks & Lakes workers, in preparation for transformation in the new Jacksonville Dog Park. A worker said the old cabin foundation is in good shape, with just one crack that can be repaired and reused for a new shelter. One Kiwanian still has the cornerstone of the hut, which was destroyed in a fire. Find out more about the University of Illinois at Urbana-Champaign Office of Recreation and Park Resources planning process, with initial plans to be presented at a committee meeting 4-6 pm Monday February 8 at City Hall, in this previous blog post. Use the blog post’s contact form to send suggestions for the new dog park to the U of I team. Posted by Steve Warmowski/Jacksonville Park Foundation President.